Manor Bedw holiday cottage is a detached barn conversion with its own large private garden, surrounded by Pembrokeshire countryside. Renovated to a high standard, it is an ideal base for exploring West Wales. A spectacular coastline and beaches in all directions, a superb area for walking, cycling and other outdoor activities, it is also within easy reach of Folly Farm, Oakwood and other family attractions. The cottage is situated in the grounds of our house, Manor Bedw. It has its own large enclosed private garden (not overlooked) with separate driveway and parking. The cottage has solid oak floors and beams, with central heating throughout and a wood burning stove which makes it warm and cosy at any time of year. The ground floor is spacious with a comfortable sitting room and an open plan dining room and kitchen, ideal for relaxing family holidays. The main bedroom has its own sitting room which enables you to use it as a family room if you wish. There are two en-suite shower rooms plus a family bathroom. Awarded 5 stars by Visit Wales. Bedrooms 1 and 2 have en-suite shower rooms with washbasins and WCs. Family bathroom with bath, washbasin and WC. Large sitting room has 3 comfortable leather sofas & a wood burning stove. It has a 40" flat screen TV, DVD player & CD stereo radio. Variety of DVDs, music CDs, games & books provided. Roberts Blutune radio for music streaming from smartphone. WiFi. Outside: There is a large enclosed private garden with parking for several cars and plenty of space for children to play. Garden furniture and a barbecue available. Utility Room: Washing machine, tumble drier, iron and ironing board. Sink and worktops. WC. Cleaning / Towels / Linen / Maid service: All bed linen, towels and tea towels are provided once a week on changeover day. Other: The open plan dining room has seating for 8 people. The large porch can store outdoor clothing and kit. Stayed here 1st to 8th of September. Myself, wife and mother-in-law and we all agree that this is the best property we have ever stayed in.If you want quality this is the place to stay.Outside there is lovely large garden completely fenced off so completely safe for children and animals.The house is very private and not overlooked.We found the house to be spotlessly clean and full of quality items from bedlinen to kitchen utensils.Although we only needed central heating once or twice it soon made the house warm and cosy.Martyn and Sue seemed to have put a lot of thought into making this place a lovely place to stay.Nice welcoming gift pack, which didnt last long.Would not hesitate to recommend this property to anyone who wanted a nice quiet stay and be within easy reach of plenty of attractions. Excellent cottage, spacious, very clean, well equiped, lovely grounds. We had a great time at Manor Bedw. It's a lovely, spacious cottage. It has everything that you could need for a short, or long stay. It's set in spacious and secluded grounds. We were left a very generous welcome hamper, and were also welcomed in person by the owners. They let us know they were on hand if we needed anything, but otherwise left us to enjoy ourselves. 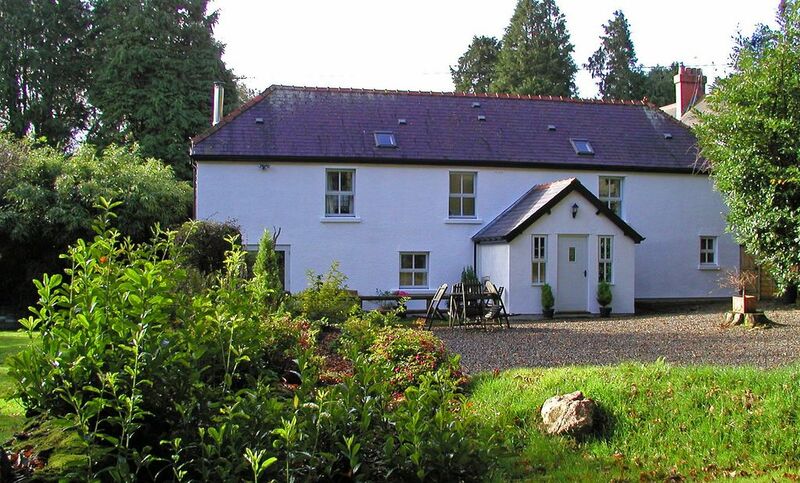 The cottage was well located to access all areas of Pembrokeshire. We did day trips to St David's, Saundersfoot, Tenby and Lawrenny, and closer to home to Folly Farm. A great holiday, thank you. Six of us stayed at this property with our 2 dogs and we loved it. Extremely well equipped with everything you could need and more. Sue and Martyn had thought of everything. Excellent quality furnishings and spotlessly clean. We loved the log burner, it gave the cottage a warm cosy feel. The garden was huge, perfect for our 2 German Shepherds. We didn't want to leave. Would highly recommend and intend to visit again soon. An excellent cottage with loads of space, a lovely garden and everything you could possibly need. The cottage is beautiful, warm, clean, well equipped and furnished and set in a well maintained and safe, large garden with loads of parking and a large lawn with table and seating for outdoor dining and playing games found in the outside shed. The owners, who live in a large house adjacent to the cottage are friendly, helpful but never intrusive. They have provided loads of information and suggestions on days out, booklets, maps, where to eat, walk the dog and much more, which is all clearly labelled and organised in accessible files, so you are never stuck for where to go or what to do in order to explore this lovely area. The cottage is very dog friendly which is actually the case all over Pembrokeshire. A welcome tray on arrival was much appreciated and basic supplies in the food cupboard to supplement our grocery delivery on arrival made self catering easy and lovely cafes and restaurants were easy to find when we were out and about. Wales is truly a lovely place to visit but the Manor Bedw cottage was the icing on the cake which made our holiday memorable and special. It was perfect! The cottage is very centrally located for the Pembrokeshire coastline. Tenby is a 30 minute drive to the south and Cardigan a 30 minute drive to the north. The nearest beach is Amroth, 12 miles away. The nearest airports are Cardiff (2 hour drive) and Bristol (2 and a half hour drive). Fishguard Ferry Terminal (ferries to/from Ireland) - 16 miles; Pembroke Dock Ferry Terminal (also to Ireland) - 22 miles. Our local market town of Narberth is a 10 minute drive away. You’ll find art and craft galleries, an excellent antiques market, a very fine deli and many small shops selling everything from designer clothes to kitchen equipment. There are very good food shops as well as excellent cafes, restaurants and pubs. There are a range of farm shops within a short driving distance selling cheese, meat, milk and locally brewed ale. There are great outdoor activities on our doorstep. We are close to the Preseli Hills, a superb area for walking & cycling. It’s known as Bluestone Country because the Preseli Hills are where the Stonehenge blue stones are believed to have come from. Great tracks for mountain biking as well. Activities in our area also include fishing, canoeing & horse riding. Pembrokeshire is famous for its beaches and a spectacular coastline. We are very central, whether you want to visit the popular beaches to the south, such as Tenby & Saundersfoot, or the many beautiful unspoilt bays to the north and west. A visit to, or a trip around, one of Pembrokeshire’s islands is high on the priority list for most visitors, whether you want the peace and tranquillity of bird-watching or seal-spotting, or the excitement of a jet-boat trip. Other water sports include surfing, wind surfing, sailing, diving & coasteering. For the child in you (or with you!) we are close to Oakwood, Folly Farm and Heatherton as well as a wide range of other attractions for all ages. For families Pembrokeshire is perfect with safe beaches, wonderful scenery, a wealth of history (castles) and plenty to do even in wet weather. Pembrokeshire has always been a magnet for artists, with its unique quality of light, spectacular coastline and breathtaking landscapes. You can spend many happy hours browsing through galleries, workshops and studios - and be assured, you’ll receive a warm welcome wherever you go. Booking Notes: Bookings run from Saturday to Saturday for full week bookings but short stays may be available outside of the main school holidays and the summer. Please feel free to contact us for details. A deposit of 25% is required at time of booking with the balance payable 8 weeks before the start of the holiday. All bookings are confirmed in writing. Changeover Day: 16.00 arrival, 10.30am departure.